A turntable is about mechanics and electronics, well mostly about mechanics. 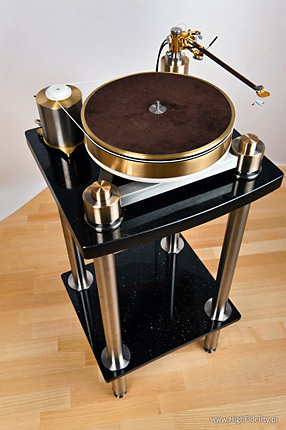 To design a good turntable one needs knowledge of both micro-mechanics and electronics. But to get a good sound you need also high-quality records. That's probably a reason why most of quality turntables come from Great Britain, USA or Germany. 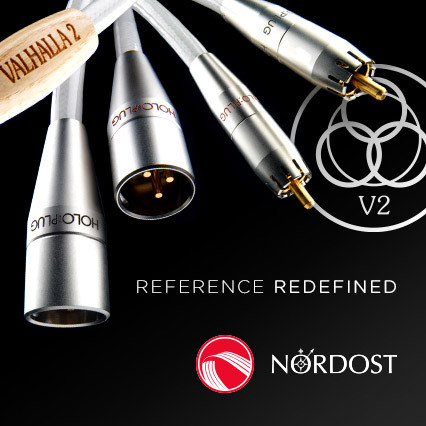 Nowadays this „rule” is not so strict anymore as one of the best in the world is Australian Continuum Audio Labs turntable, but still those who have most experience with such a complex setup as deck/tonearm/cartridge (these are still British, American and German companies) have in general a clear advantage over the other competitors. Surely we can't forget another exception - French Verdier. Manufacturers in Eastern Europe had enough knowledge of both – mechanics and electronics but they simply didn't have an access to high-quality pressings and that limited what could be achieved with (among others) Polish turntables. I'm not saying that they were poor products, no they weren't but even some upgrades couldn't elevate sound quality to a higher level so there was no use to keep making them. Surely there were more reasons why Bernard, Daniel and Unitra's decks with simple tonearms were the top achievements but the truth is they were. Just to make my point clear – these were quite some achievements of Polish manufacturers considering circumstances. I personally owned Unitra's GS-464 as the first „real” turntable and still remember its sound. Surely it wasn't first class sound but it was good enough then. One day out of the blue I got an information from … I think Srajan from 6moons.com magazine, that he had found out about some Lithuanian company making expensive high-end turntables. I don't know which one of us was more surprised but without any delay I opened their web page – turntables.lt (that is also a brand name which is not in my opinion a very catchy one). And surprise, surprise! 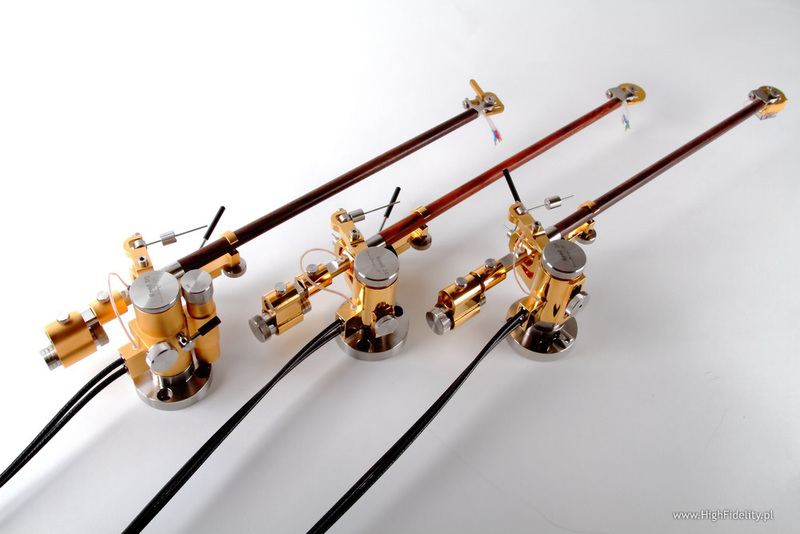 Tonearms caught my attention immediately – wonderful designs with some elements known only from the most expensive solutions on the market. At the first glimpse they looked bit like products of DaVinci but than I learned these were proprietary products. Surely some details, solutions were „borrowed” from some other designs but this is what the progress is about – you don't have to start from scratch, you can make some already existing things better. After all this is more like cumulative branch of science (like physics of maths) rather than facultative (like Polish philology). Short email exchange with guys from Lithuania and … everything was set. I was supposed to get a turntable equipped with arm in six month time as this was their estimation of period necessary to get a CE sign for their product and to make it more or less repetitious one. So half a year later I could finally shake hands with two guys in charge - Jonas Jakutis and Vidmautas Triukas who came to me from Kovno. As I already mentioned in my leader in April's issue the meeting was very enjoyable both socially and professionally, and both my guests turned out to be „cool guys” so to speak. We had a long conversation (in Russian, English and Polish), spent a great time and than they left. But there was a small „souvenir” standing next to my Base rack. It was the Black Stork turntable with its own integrated base similar to ones offered by Transtotor, Acoustic Solid or Clearaudio equipped with three tonearms: Reed 3Q, Reed 2P and Reed 2A, all of them with 12” length. There are also 9” and 10,5” versions available. Kraftwerk, Autobahn, Capital Records/KlingKlang/Mute Records, STUMM 303, 180 g LP (2009); review HERE. Kraftwerk, Tour The France Soundtracks, EMI Records, 591 708 1, 2 x 180 g LP; review HERE. Led Zeppelin, Mothership, Atlantic Records, R1 34470, 4 x 180 g LP. Nirvana, Unplugged in New York, Geffen/Universal Music/Original Recordings Group, ORG 034, 180 g LP; review HERE. Frank Sinatra, Sinatra & Strings, Warner Music/Mobile Fidelity, MFSL 1-313, No. 199, 180 g LP; review HERE. Yamamoto, Tsuyoshi Trio, Midnight Sugar, Three Blind Mice/Cisco Music, TBM-23-45, 45 rpm, 2 x 180 g LP; recereviewnzja HERE. Electric Light Orchestra, Time, Jet Records, JET LP 236, LP. Depeche Mode, Wrong, Mute Records, 12BONG40, maxi-SP; review HERE. Boney M., Take The Heat Of Me, Hansa International, 65 201, LP. Boney M., Ocean Of Fantasy, Hansa, 200 888-320, LP. All Japanese issues are available at CD Japan. Lets start with tonearm, or the material it is made of. As already mentioned there are couple of versions and the main difference is the material the armwand is made of. I received for test two versions - „pantzerholtz” and „western redcedar” (there is also one made of carbon fibre). Most of the time I used this second one but I exchanged it with the first one for some particular listening sessions too. Even if I had any doubts before listening session now they were all gone. When Jonas and Vidmantas explained how the wooden arm worked they also told me that in their opinion the best choice was American Red Cedar, although my „logic” suggested that „pantzerholz” should have been better as it was harder, more rigid and so on. After listening I realized that Lithuanian guys were right – Cedar makes sound much more attractive, than any other tonearm's material. And I don't simply mean a different sound as it was to be expected. The point is that these changes in the sound are more profound than just a change in tonal balance (which is present too of course). 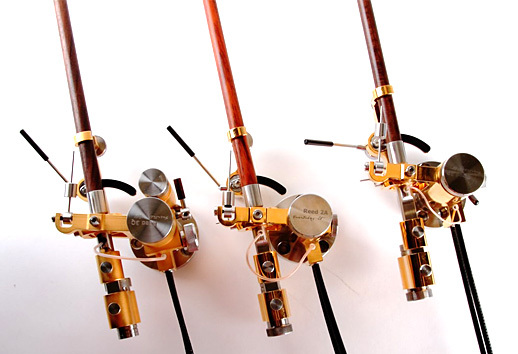 Tonearm made of Cedar offered more quiet sound. My friend, who had a chance to listen to Transrotor Argos, and Bergmann Audio Sindre during my tests, said when listening to the Black Stork, that instruments were less „real”, not so well differentiated – and all that despite the fact that these two turntables played with AirTight's PC1 cartridge and the Stork with absolutely brilliant version of this cartridge - Supreme. And I can understand him up to some point – it's true that Bergmann offered more open sound with better resolution. Just as … Black Stork with pantzerholtz arm. Sindre delivered bit more precise sound, particular layers were emphasized in stronger fashion, but in my opinion Lithuanian turntable presented it more natural – more like what I remember from my listening session with Argos. 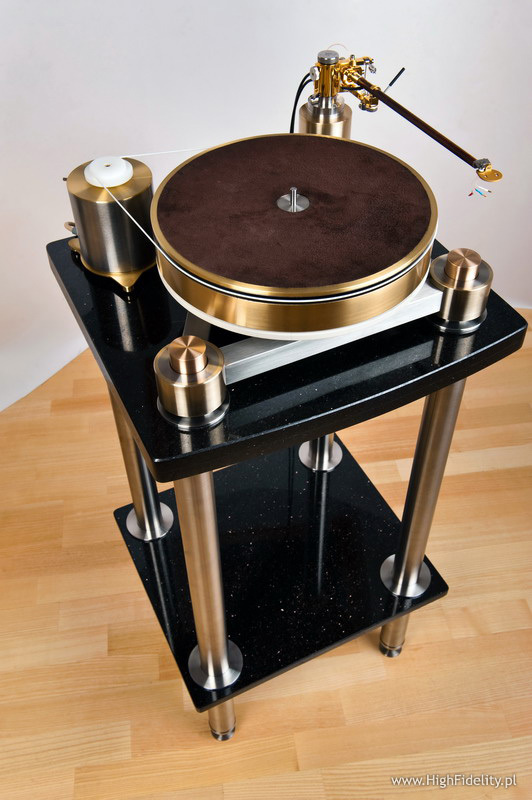 The last opinion concerns turntable.lt with… Cedar arm. Not to mix things up any more I should say that the Cedar arm offers dense, bit dark, very well balanced sound. When I say „dark” I don't mean that the treble is somehow limited or withdrawn. This reminds me impressions from listening session of Acrolink's power cord 7N-PC9300. In general it makes sound bit dark, the tonal balance seems rather on the dark side. But only until there is some instrument in the upper frequency – than we get something amazing – perfectly controlled attack with brilliant reverberations. Usually such sound is called „vibrant”. The point is that this time it is not about the „phenomena” of particular moment but about permanent, very basic, fundamental even feature of the sound. Sudden appearance of cymbal tones after what we thought was a piece of dark sound, catches us off-guard, we couldn't see it coming. It is even more special because the noise of stylus moving on the record is very low – such a low noise I encountered only when listening to Argos, and in my friend's system when SME30 was used (report HERE). Both above mentioned turntables do it even better, they better distinguish what's still music and what's noise/distortion. Altogether it concluded in very well balanced and tonally extremely rich sound. Not everybody (check at the beginning of „Sound” section) will be happy with this sound, but than they can use another arm to get more energetic, well extended bass range. The best bass is offered by Cedar arm – that could be easily heard during sessions with Oh, well from Depeche Mode Wrong single, or even from Boney M. records. Continuity of the sound was amazing and the credit should go to both: tonearm and the deck. The latter offers surprisingly good quality and almost no impact on the sound – so in a sense it can be taken out of the equation. Argos or SME are still better in this respect but Lithuanian deck definitely offers more than I could expect from such a, to be honest, simple design. I'm pretty confident that guys from Kaunas can still find some space for improvement, but I admire what they already achieved.